It was the first week in August when the Tibetan nomads come into the township of Litang for a yearly festival. Horse racing, dancing, singing, socialising, and so on. It’s the event of the year, and a time when provisions are bought, marriages are arranged, and the clans are out there on the green valley floor enjoying an all too brief summer on the roof of the world. When autumn comes the grass will turn brown again and the first snowfalls will drape the valley in a blanket of snow. That’s when they will pack up their tents and take their animals to lower altitude grasslands for the winter. At the moment, the grass is still a fresh emerald green. Colourful prayer flags are everywhere and patches of white, yellow and blue wildflowers are smudging the landscape. The brown-grey Mount Genie massif is guarding the valley from under a clear purple sky – the thin atmosphere deepening the colour – and the town is humming with activity. I had been wandering around. 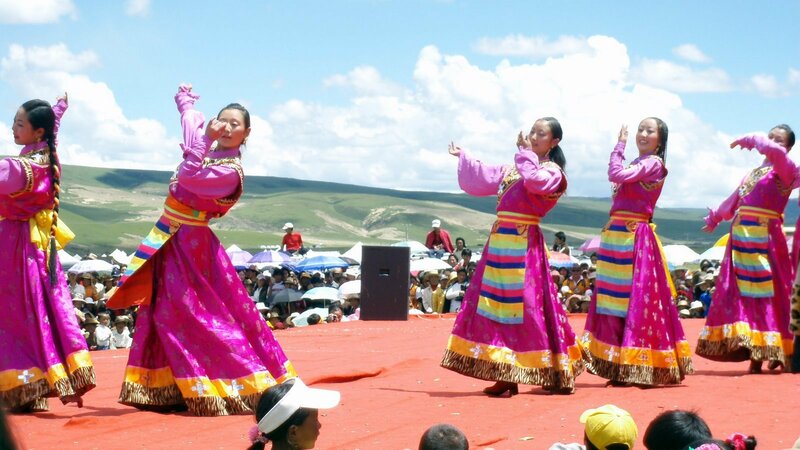 The best event was the concert on an open-air stage facing the rolling green hills to the East. The back door to Litang. Visiting singers and dancers performing. Handsome young men and extraordinarily beautiful ladies in traditional costumes. On a wooden stage, under the clearest brightest sky I have ever seen in my life, in the Maoya Valley, on the Tibetan Plateau, at 4200 metres above sea-level. It’s another world up there. Behind this grand event is a history of trouble though. It had been banned by the Chinese for several years. Tibetan nationalism had reared its head, so the Chinese government cut it off. As you can imagine, the Chinese are not too popular up here. Anyway, things settled down, so the nomads had been allowed to enjoy their traditional festival again. All went well for a few more years. Until this year. Greedy local county administrators were squeezing the Tibetans for their ten percent again. For example, recently they persuaded the nomads – who have their own independent grazing lands – to form a cooperative to market their stock. The idea being to get better prices. Which they did. However, they didn’t bank on the government officers taking their cut. So the pissed-off nomads disbanded the co-op, and they and their yaks returned to their independent lifestyle. These proud people measure their wealth and status by the number of yaks they own. So, when the central government administrators began squeezing their traditional festival for extra income, they got upset. Naturally. They should know by now that if you upset nomads there’s bound to be trouble. 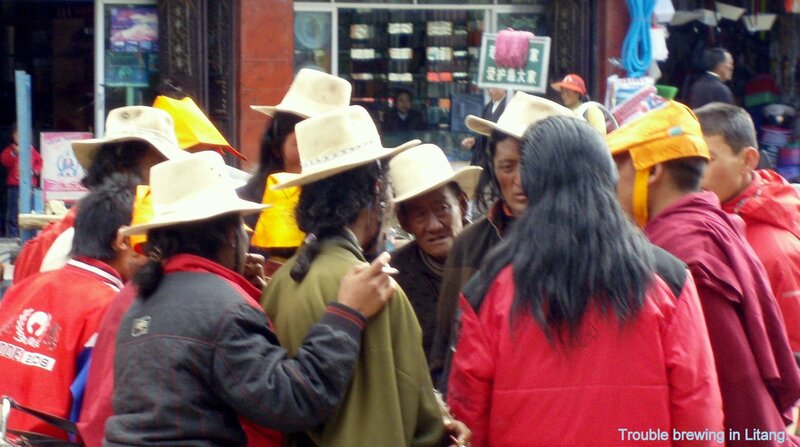 In fact, I had smelt it coming when I came across a group of them complaining to each other in the main street of Litang. But I had no idea of what was about to happen. I was sitting in the common room of the Potala Inn, after helping my manager friend Medok with her full house. Her staff – less than skilled relatives – were overwhelmed by the influx of Chinese and European visitors and were making a mess of things during the busiest week of the year. The hot-water system was failing, a mature-aged French couple were complaining loudly, and they were hiding. Medok was in a heated argument with the rude Frenchman, some Chinese were asking for service, so I did my best to help out by looking after the bar and the bookings. When everything had settled down, I sat down with Amit, an Israeli traveller who had arrived from Kangding. He was a reserve soldier who had been involved in a recent stoush with Hezbollah in Lebanon. His experiences in fighting a war among a civilian population reminded me of my own in Phuoc Tuy Province in Vietnam, so as you might imagine, we had a few observations to share about guerrilla warfare in such difficult places. So it was ironic that at around 6:00pm Medok told us that the Police had phoned saying that four protesting Tibetans had been shot and killed that afternoon, and as a consequence nobody was allowed out on the streets that night. Medok filled us in. The nomads had been demonstrating against the greed of local administrators outside their Government office. The Police station – an armed camp really – was across the road, and one thing led to another. Water cannon from a fire-truck, enraged nomads, fearful police, and four dead Tibetans. More nomads on horseback outside the town threatening mayhem. Next morning Amit and I went for a look. Communications had been shut down, but Amit had a satellite phone which still worked. So I texted my daughter back home in Australia to contact Amnesty International and report the shootings (she was a member). That done, we walked down the main street. Armed soldiers, shoulder to shoulder and moving forward toward us were clearing the street. What should we do? We remained on the street, pretending to be innocent tourists as we strolled toward the line (I had put my camera in my pocket so as not to provoke any trouble). You may not believe this, but a gap opened and we passed through it without difficulty. Their commander had looked at us, and I could see that he was confused. Civilians are supposed to run in the other direction. But we had figured correctly that this was a show of force rather than a lethal clean-up (that would come later as the authorities searched for ‘ringleaders’). Although you might be able to intimidate Tibetan civilians because that’s an in-country matter, foreigners are a different kettle of fish. If you don’t want to draw attention to another ‘incident’, you are better off leaving them alone. That’s what we figured later anyway. I suspect also, that his orders did not tell him what to do if he encountered any foreigners. Chinese institutions never encourage individual initiative. The few foreigners in town for the festival took the hint and got out immediately. Either by bus or hired van down to Kangding in the East, or to Zhongdian two days travel away in northwest Yunnan. The rich Chinese disappeared in their European limousines. I waited another day (one bus per day: couldn’t get a seat anyway) and stayed to watch the town get locked down as soldiers arrived. Probably trucked in overnight from their barracks in Kangding. I didn’t push my luck though. Stayed indoors at Medok’s empty Potala Inn. Just me, Medok and her staff. I caught the only bus out of town the next morning. To Zhongdian via two mountain passes and an overnight stay in Xiangcheng. Downhill all the way. 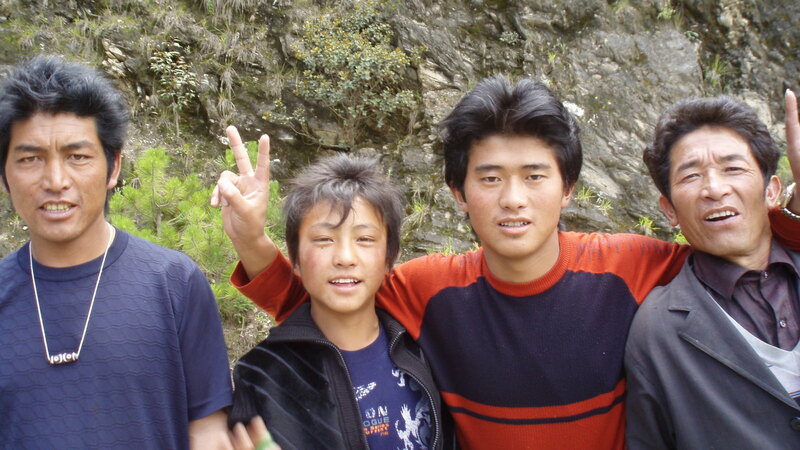 Befriending three Tibetan brothers who looked like they had left town in a hurry. They had good reason to be nervous. The driver had spotted a police roadblock ahead and he halted the bus so that they could exit and disappear over the side into a gully which ran parallel to the road. Good man. After the police searched the bus, as soon as we were out of sight, we stopped and waited for our three friends to bypass the roadblock and rejoin us. Everyone on board seemed to be happy about this. And when we finally arrived at the parking area behind the bus station in Zhongdian, the brothers exited quickly and slipped over the back fence. But not before thanking me for my company. In fact, the youngest one said: “We love you” in English. I am not sure what they saw in me, but I was happy to know that in some small way I had been a support. And in one of those wonderful coincidences that life throws up every now and then, when I was passing through Kangding a year later on my way back up to Litang, I was accosted by a young Tibetan man in the main street. Guess what! It was the middle brother. He looked healthy – it was obvious that the diet he was on now was an improvement on yak meat and potatoes – and he looked happy. He and his brothers had found work in Kangding. I reckon that was a pretty good happy ending. I mean, if you can’t free Tibet, helping to free a few Tibetans is probably the next best thing.